The thing to remember with both alcohol and benzodiazepine withdrawal is that THEY CAN KILL YOU! Since alcohol and benzodiazepines both work on the GABA receptor (potentiating the effect of GABA by increasing the frequency of channel opening) they are cross-reactive. 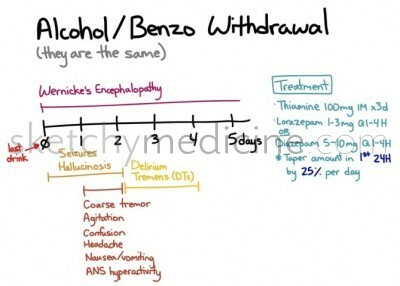 This means that you can treat alcohol withdrawal with a tapering dose of benzos (and you can treat benzo withdrawal also with a tapering dose of more benzos). The thing to watch out for with someone who has chronically used benzodiazepines and has suddenly stopped is that the onset of symptoms will depend on the half-life of that particular drug. 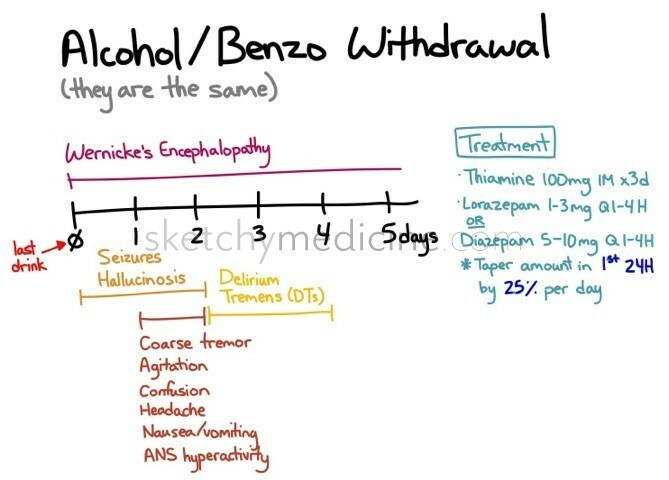 To minimize benzodiazepine withdrawal symptoms if someone has extended use (>3 months): taper by 1-20% over 6 or more weeks and/or switch to longer-acting agents. This entry was posted in Drugs, Emergency, Psych and tagged pharmacology, withdrawal by Ali. Bookmark the permalink. These are awesome!!! Thank you so much for putting them online!